When fresh markets, farm stands and gardens are overrun with ripe tomatoes, cucumbers, peppers and onions, I could eat gazpacho every day. I love to make runs downtown to the Union Square Farmers’ Market to check out the fabulous local produce. 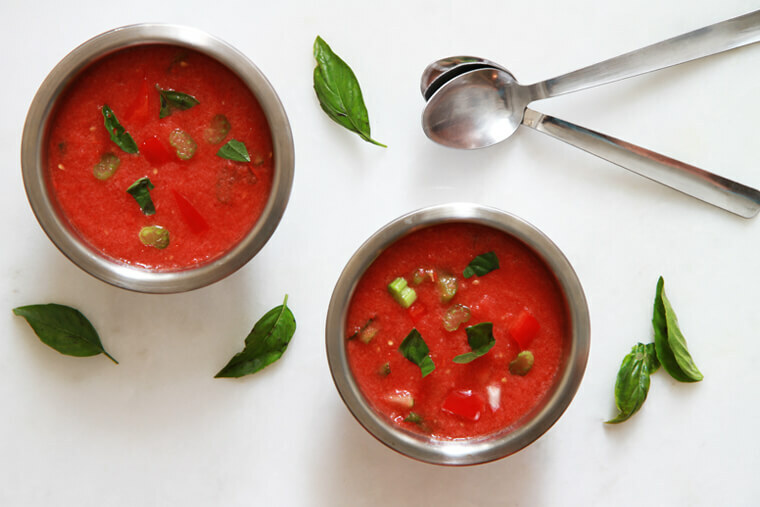 I look for the juiciest tomatoes I can find to make this refreshing and zesty gazpacho. There are no hard-and-fast rules in making this recipe. 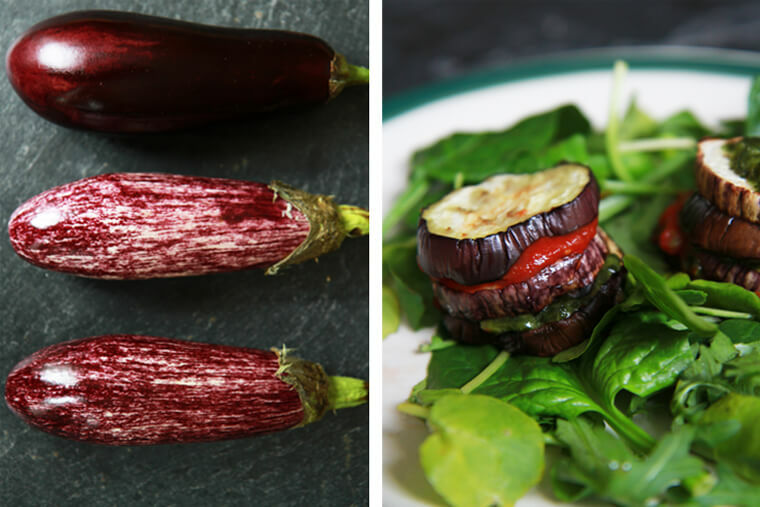 You can adjust the amounts and types of vegetables to your liking. This soup is a celebration of freshness – in the body and in the season. 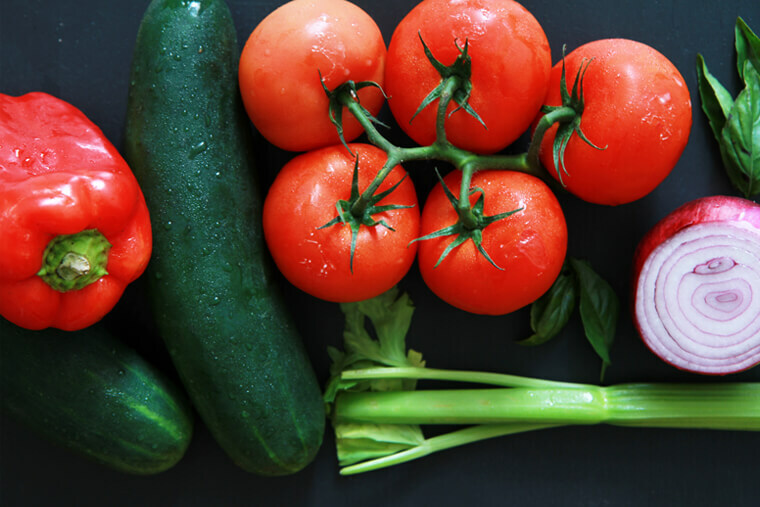 What are some of your favorite ways to use your farmers’ market bounty? Place the tomatoes and tomato juice in a blender and process until smooth. Transfer to a large bowl. Add the chopped bell pepper, celery, red onion, garlic, cucumber, basil and black pepper to the soup and stir well. Cover and chill in the fridge overnight. This allows for the flavors to meld. To serve, ladle the soup into bowls and garnish with whole basil leaves. Enjoy. Oh, I’ve been looking forward to sharing this with you! Not only because it has become my favorite snack/meal, but also due to the fact that it is a tribute to spring and all the amazing light summer meals this time of year! While we have seen many more rain showers than we’ve seen the sun over the last few days, I know warmer temperatures are on the way (fingers crossed!). 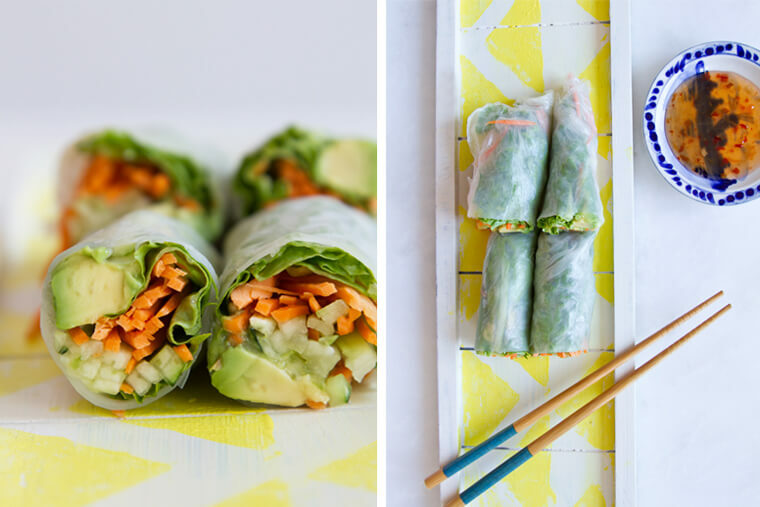 Spring rolls are the perfect food to get you feeling like warmer days are already here. Before I made my first spring roll, I have to admit, I was intimidated to take on the task – especially after my sushi rolling experience. But let me tell you, once you start making your own spring rolls, you’ll never stop. It is so much easier that you would think, and this way you can come up with crazy concoctions that you would not be able to order from take out. After a little practice, I know you’ll be raving about them as much as me. 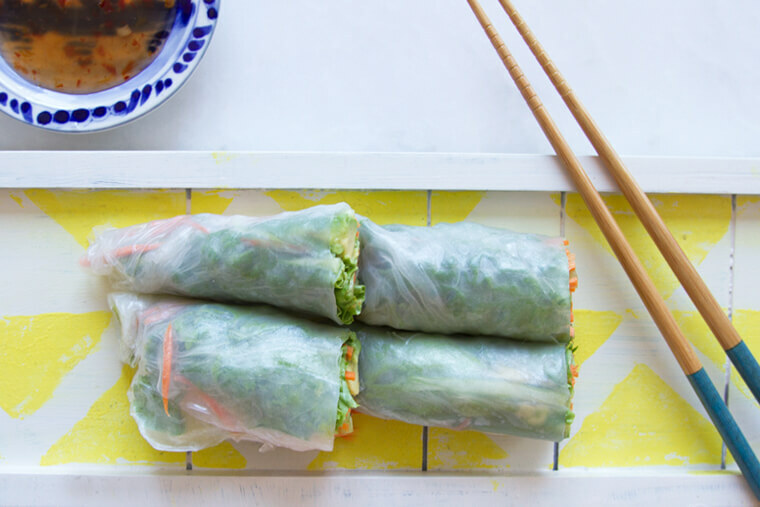 I love the idea of stuffing what is fresh and seasonal into a spring roll. Because spring is here, I chose to go with a mostly green veggie palette – cilantro, lettuce, avocado, cucumber and carrot for a little color and something sweet. Use whatever you have on hand and what is in season. 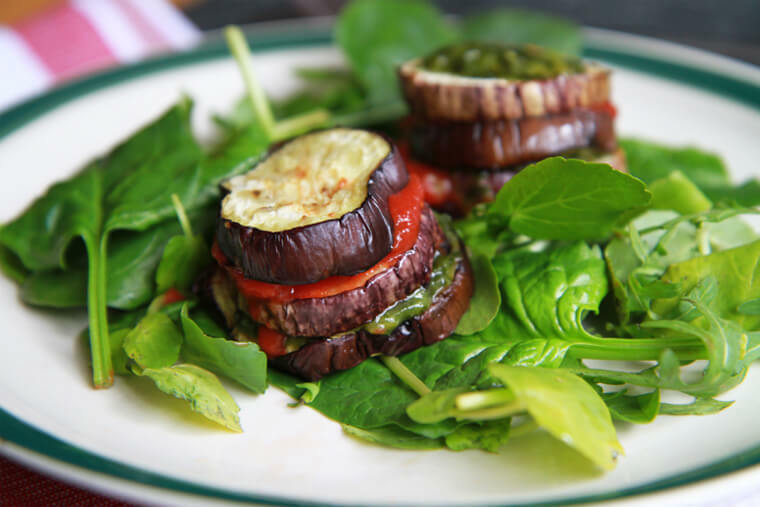 This meal is a great way to use up all the little bits of veggies hanging out in the fridge that you haven’t found a use for. Set up your roll work space. You need a large bowl of warm water and a damp dish towel to work on. Set out your lettuce, cilantro, carrots, cucumber and avocado. Working one roll at a time, put the rice wrap flat into the large bowl of warm water, being careful to not let it curl up, until soft, about one minute. 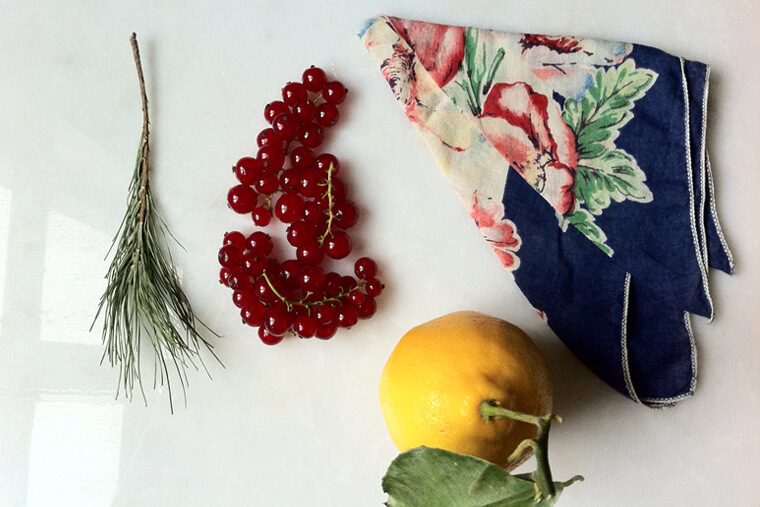 Lay the wrap down on the dish towel. Down the center, like a burrito, layer the cilantro, lettuce,small handful of the carrots, cucumber and a few slices of avocado. Fold over the top and bottom ends over the filling, tuck the right flap over and then roll to close. Repeat with remaining wraps. How is it only now I’ve been introduced to white asparagus? I remember seeing it in the States, but for some reason I never gave it a try until moving to Europe. In Cork, white asparagus is coming into season and it can be found in every market. I’m really beginning to love asparagus because it’s one of the few vegetables that can stand on their own – artichokes and leeks are the others -and can be served warm or cold. But white asparagus, with its ivory color, is also elegant. It has a special delicacy and less herbaceousness than the green and is less likely to be bitter. It is nutty, succulent and satisfying, which is why just three or four thick spears makes a substantial side dish. Since it’s season is short, I grab the white while I can. White asparagus is grown completely underground, a process called etiolation. The spears are deprived of light which prevents the plant from producing chlorophyll, thus there is no green color to the stalks. Asparagus is a great source of many nutrients, including fiber, folic acid, calcium and iron. But one thing that may surprise you is that asparagus is loaded with the lesser-known vitamin K. Some vitamin K in our bodies is actually produced by the friendly bacteria in our gut, but the majority we get from the plants that we eat. 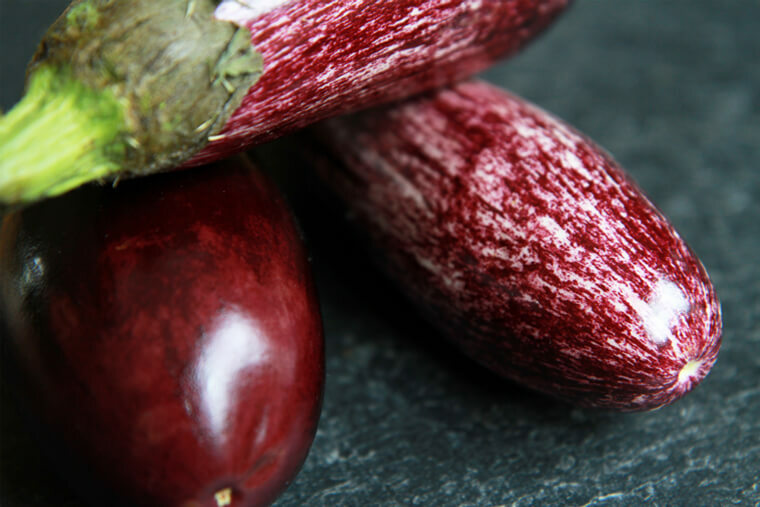 I chose to dress this veggie with a tart, juicy currant jelly which compliments the asparagus’ delicate flavor. It may sound crazy mixing veggies with berries, but it really works. Simply delicious. Rinse the asparagus. Using a knife, remove the bottom 1/2 inch of each spear. Remove the tough peel from each spear using a vegetable peeler. Brush each spear with coconut oil. Sprinkle with salt. Place the spears on a grill rack over medium-low heat, taking care not to break any of the spears. Turn frequently, every minute or so, using tongs to prevent burning. Grilling uncovered is best due to the constant attention needed during cooking. Spears are ready to serve when there are light brown grill marks on each side. Cooking time will vary according to the specific temperature of the grill being used and the level of doneness desired. 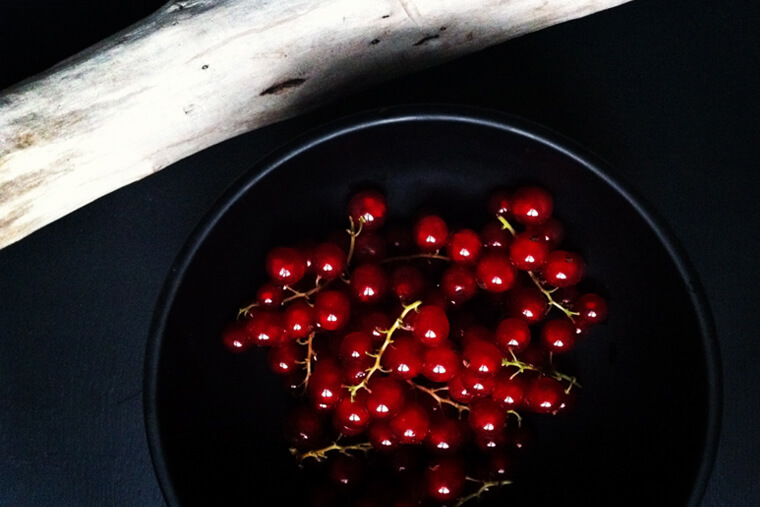 Place currants in a bowl and mash with a spoon. 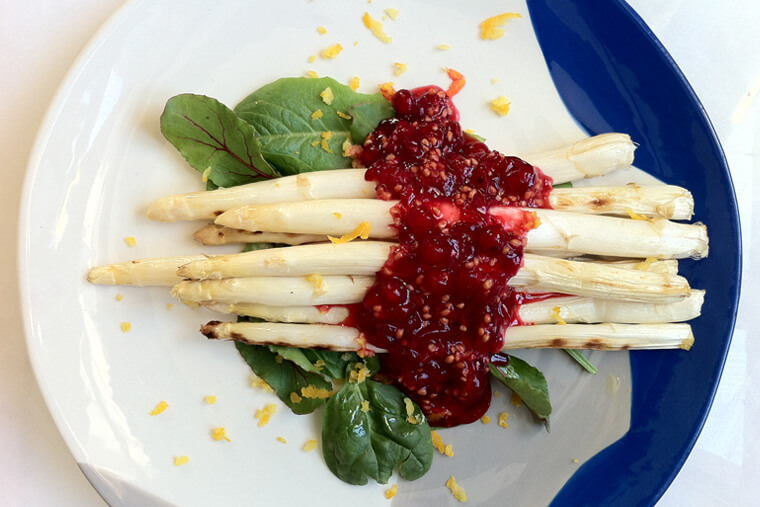 Place grilled asparagus on top of a fresh bed of spinach and top with currant jelly and lemon zest. Enjoy.